This story is my formal introduction to Mark Twain - I may have read some random short stories while growing up, but I haven’t registered any of them to form impressions. This “book” is more like a short-story, but one with a lot of punch. The narrator encounters an Indian man on a train journey. The Indian shares a very weird and interesting story of his involving the missing case of a white elephant from Siam. To placate the English monarchs, the King of Siam gifts a unique and magnificent white elephant, born and bred in Siam, to exclusively serve the royals. The Indian was in the civil services serving the Indian government which at that time was part of the British rule. He was assigned to hand over the elephant to the Queen of London. On their way to London en-route the US, the elephant gets stolen in New Jersey, despite the heavy security and the apparent conspicuousness of it being a giant white elephant. 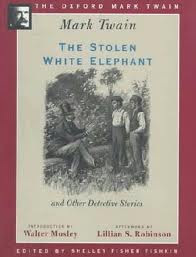 The story is a satire of the police force and its band of detectives as they scurry around trying to recover the elephant. Portions of the book are hilarious and make you chuckle, while other portions are full of dark humor reflecting the inefficiency and cunning under-hand strategies of the police department. I had to snicker here - if Twain could poke fun and ridicule at the seemingly efficient and vigilant police force in the US, it’s sad to think of the mockery that the Indian police force receives everyday. It was an interesting and short read, delivering sharp sarcasm and wit. The plot is also delivered through a series of news paper headlines and the detectives snippets of telegrams, making the structure of the writing quite novel and interesting.